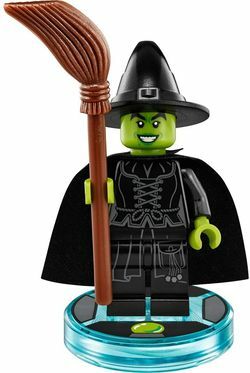 The Wicked Witch of the West is a Dimensions minifigure released in 2015. She is playable in LEGO Dimensions via 71221 Wicked Witch Fun Pack. The Wicked Witch of the West is loosely based on Margret Hamelton's portrayal of the character. She wears a black pointed witch's hat with a buckle on the front. The witch's face is bright yellowish green. Her eyebrows are thick, pointed and black and situated above her black eyes. Her eyes have a single eyelash coming out the far side and inside they have a white pupil. Her mouth shows her smiling displaying her set of white teeth, which are outlined in black. Her mouth is decorated in bright green lipstick. Further details are a bright green upper dimple in each top corner, and a bright green mole in the left bottom corner. Around her neck the Wicked Witch of the West wears a black ankle length cape. Her torso is mainly black but details are added with medium stone grey printing. The top displays several creasings in her cloak. Curved medium stone grey lines go underneath these creasings and then go straight down. There's diagonal placed strings with holes at the end across this design. Underneath the diagonal strings she has a string, tied with a large not in the centre tied around her stomach. The torso then has three triangular points at the bottom of it. The sides of her torsos feature medium stone grey feminine curves. The Wicked Witch of the West's arms are black and her hands are bright yellowish green. Like her torso her legs are mostly black besides the additional medium stone grey printing. Her legs have medium stone grey curvy lines. Her right side has a pocket with strings with three strings falling out. In LEGO Dimensions, the Witch is identical to her appearance in 71221 Fun Pack. She will have the ability to fly on her broomstick. The Wicked Witch of the West controlled three counties of Oz with her sister, The Wicked Witch of the East thanks to the power of the ruby slippers worn by her sister. One day a house came down and killed the Wicked Witch of the East. The Wicked Witch of the West came quickly to discover what happened. She looked for the ruby slippers but she could not find them on her sister's feet. Her good sister Glinda the Good Witch of the North told her that the slippers are now on Dorothy Gale's feet. The Wicked Witch of the West asked Dorothy to hand her the shoes but she won't. The Wicked Witch of the West claimed she'll get the ruby slippers from Dorothy and kill her and her dog, and she then leaves. When Dorothy's was walking down the yellow brick road with The Scarecrow and The Tin Man, the Wicked Witch of the West attacked them with fire. Unsuccessful in a plot to kill them she returned to her castle. She decided on her next plan to kill Dorothy, make poppies that will make her fall into an enchanted sleep. When the plan began to work it was quickly foiled by Glinda who created snow to wake Dorothy and The Lion up. Annoyed, the Wicked Witch of the West flew on her broom and wrote in the sky "Surrender Dorothy". This frightened Dorothy and her friends and it didn't help when the Wizard of Oz sent them on a quest to steal the Wicked Witch of the West's broom. The Wicked Witch of the West sent her winged monkeys to go out and capture Dorothy and Toto, and they did so. The winged monkeys brought the two to the castle of the Wicked Witch of the West. Toto escaped and told The Lion, The Scarecrow and The Tinman where Dorothy is. They came and rescued her, furious the Wicked Witch of the West chased them. The Wicked Witch of the West tried to kill them off one by one, firstly she lit The Scarecrow on fire. Dorothy attempted to save the Scarecrow by drenching him in a bucket of water. The water ended up on the Wicked Witch of the West which melted her. Wicked Witch is currently the only playable character from the The Wizard of Oz. Facts about "Wicked Witch of the West"
This page was last edited on 17 February 2017, at 00:20.